There are a number of similar tools available to help KS2-KS3 pupils develop skills of writing sequences and presenting systems in an appropriate flowchart-based format. Flowol is the most famous example but there is a free and fully functional alternative called FlowGrid. Build your flowcharts to control the given scenario and run them to view the results of your work. Available mimics include traffic lights, a zebra crossing, a lighthouse and more. 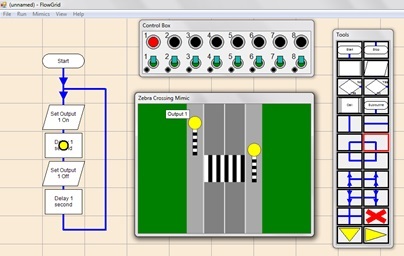 Once opened, press on ‘Mimics’ and select one of the scenarios. The best starting place is the zebra crossing mimic. When you add a symbol to your flow chart you should right-click it to specify the commands for the symbol. Before running your program you should select ‘Turbo’ from the run menu to ensure the program runs to as lifelike a speed as possible. FlowGrid comes as an executable program file (no installation is required). You may need to check with your network administration team to ensure the students are able to run this program or to ensure a suitable alternative method of using the tool is put in place. Lesson One: Introduction to control systems and FlowGrid. Zebra crossing mimic. Lesson Two: Traffic light and road junction mimics. It is recommended that students screenshot each completed flowchart and annotate it to reinforce and demonstrate their understanding of the systems and vocabulary involved.